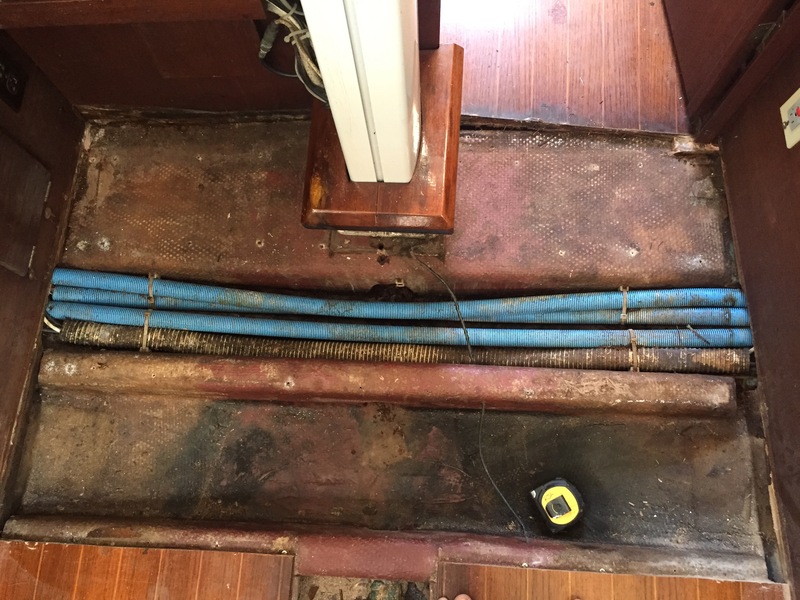 Apparently there is a pretty consistent problem with Sabres of a certain vintage where the mast step doesn’t have a large enough drain, thus gets clogged easily, and saturates the structure and sole of a boat. I’m really surprised Sabre took so long to address this issue, but Vellamo certainly fell victim to it. It’s well known enough of a problem that they have a name for it, Sabre Rot. This is the floor as I bought it. Here you can see the plys of the plywood delaminating. I don’t know if this is common, but Sabre had a layer of plywood, then a layer of fiberglass, then plywood with teak and holly veneer over it. Makes for a solid floor and maybe it was part of their “solution” for the floor getting wet? 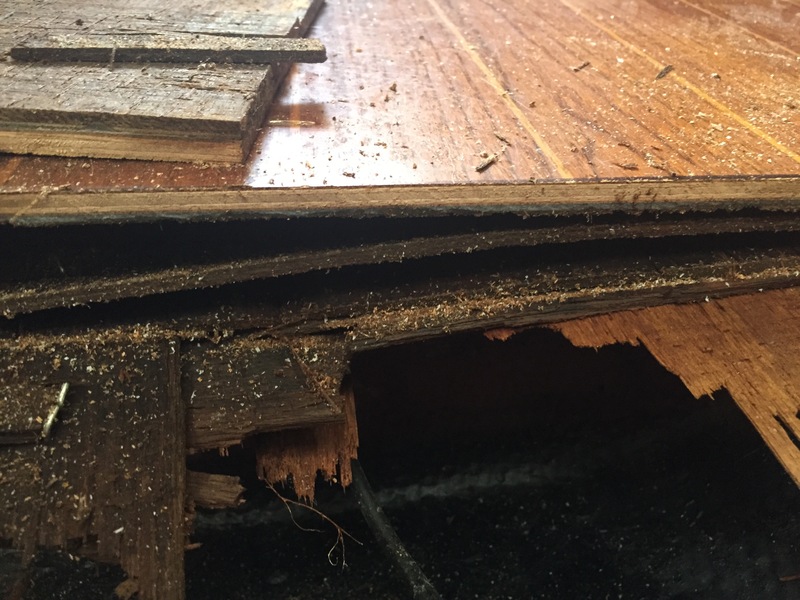 This shows how rotten the wood actually was. It crumbled apart in my hand, and I could squeeze water out of it! This is with that section of floor removed and ready to put new plywood down. I’m not doing the whole floor at this time as this was done solely (haha… Get it?) to satisfy my insurance requirements before I navigate any waters with the boat. I don’t have a shot with the plywood on it, but you can imagine ugly plywood floor in this place. It’s temporary until I can figure out which product I want to use and redo all the floors in. 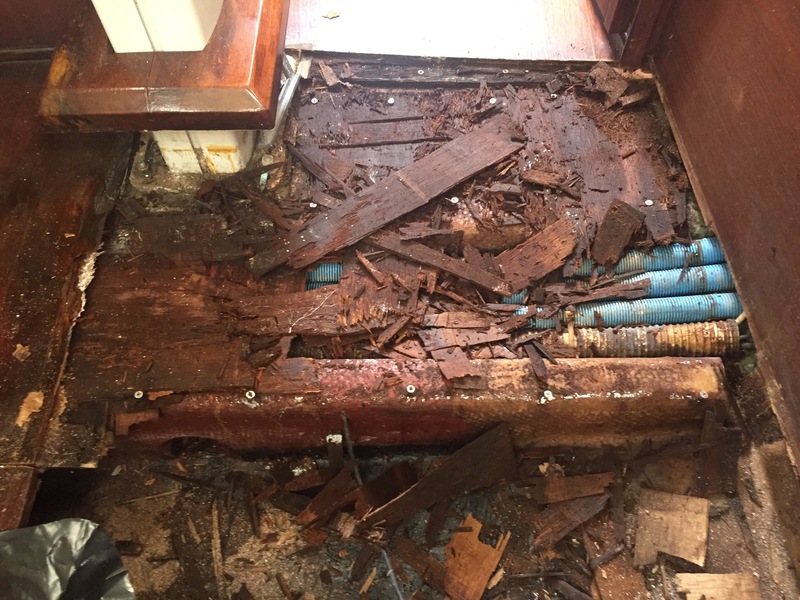 This entry was posted in Interior, Repair/refit/upgrade. Bookmark the permalink. Where is the drain so I can check mine to be sure it’s clear? It’s right at the base of the mast right under the sail track. 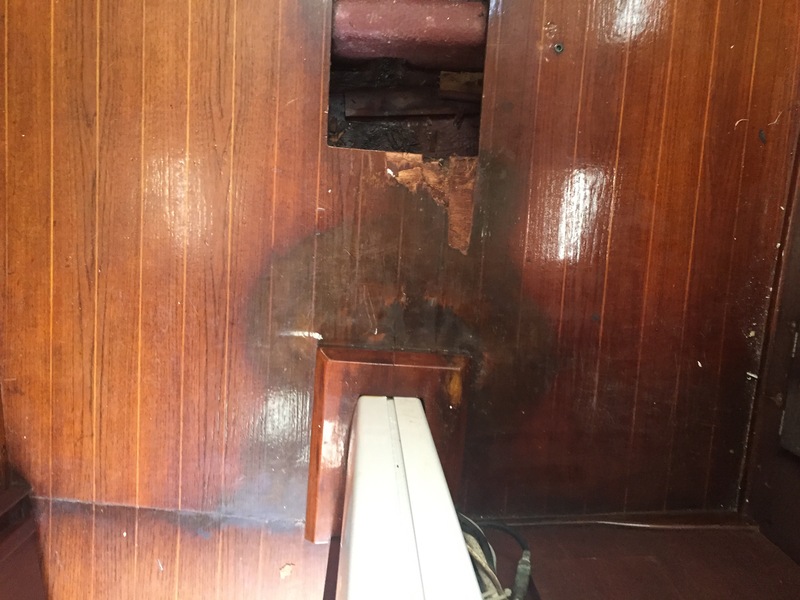 The mast sits on a stringer there, which is wood wrapped in fiberglass, and mine had two holes in that beam to the bilge. I couldn’t actually get at it till I pulled the floor. If you take an inch or two of floor out right at the base of the mast, you’ll see it.